The Korean Peninsula has emerged as an epicenter of nuclear tensions. North Korea’s nuclear program has accelerated in recent years, and extravagant threats traded by U.S. and North Korean leaders in 2017 stoked fears across the region and beyond. Intelligence assessments as well as the statements of Kim Jong Un and other North Korean officials suggest that North Korea’s nuclear ambitions have not been laid to rest. However, relations between North Korea and South Korea are improving; stronger relations have been forged between Supreme Leader Kim Jong Un of North Korea and President Moon Jae-in of South Korea, and their respective teams, offering hope of a solution to the conflict that tore the region in two seven decades ago. In June 2018, Kim Jong Un and U.S. President Donald Trump met in Singapore to discuss the North Korean nuclear program — marking the first-ever talks held between a North Korean leader and a sitting U.S. President. Trump and Kim Jong Un met again in Hanoi in February 2019 to continue talks. 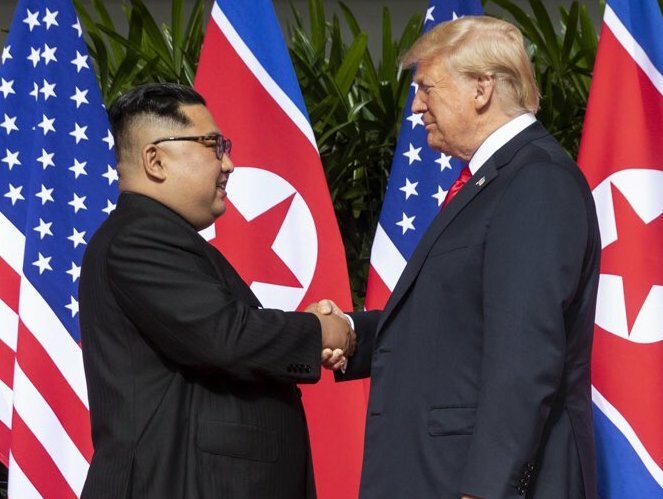 However, the Hanoi Summit ended abruptly with no deal, and the future of United States-North Korea relations remains uncertain. Implement progressive North Korean sanctions relief and economic assistance in parallel with progress on denuclearization. "Without substantive negotiations, U.S.-North Korea relations could easily return to the aggressive rhetoric that we saw in 2017 — and it could have a worse ending." Tracking the history of United States-North Korea relations and updates on denuclearization talks. Global Zero’s recommendations for pursuing future talks on denuclearization on the Korean peninsula. Pyongyang’s nuclear and missile programs continue to represent a major challenge to global security, and Trump must empower U.S. negotiators to work out a deal that reduces the risk of nuclear confrontation and serves the security interests of the United States, North Korea and the world. “On Thursday, Jon Wolfsthal, director of Global Zero’s Nuclear Crisis Group, and former nuclear expert for the National Security Council under Barack Obama’s administration warned that President Donald Trump’s summit in North Korea is nothing more than an ‘illusion of progress,'” reports Raw Story. Jon Wolfsthal, director of the Nuclear Crisis Group, referenced in article about the Hanoi Summit. He said while the breakdown in talks was a disappointment, there is still room for diplomacy. The notion that Mattis, a former four-star Marine Corps general, could have blocked or defied a move by Trump to impulsively launch nuclear weapons may have seemed comforting, but it shouldn’t have been. The Secretary of Defense has no legal position in the nuclear chain of command, and any attempts by a Secretary of Defense to prevent the president from exercising the authority to use nuclear weapons would be undemocratic and illegal. In a new report released on Tuesday, Global Zero’s Dr. Bruce Blair, a former Air Force launch control officer who’s a nuclear security expert at Princeton University, argues that the United States’ nuclear stance is a “vestige of the Cold War” that creates instability with an unnecessarily hefty price tag. The status of talks between the United States and North Korea remains uncertain. However, continuing the diplomatic process between all parties must be the next step, as dialogue is the only option for pursuing denuclearization on the Korean peninsula as the long-term goal. “fire and fury” rhetoric of 2017 between the United States and North Korea. We need an objective timeline for what North Korea is going to achieve. And we need to be able to put people on the ground to verify that they’re doing what they say they’re going to do.